Finally! We have a dedicated space for all things creative. 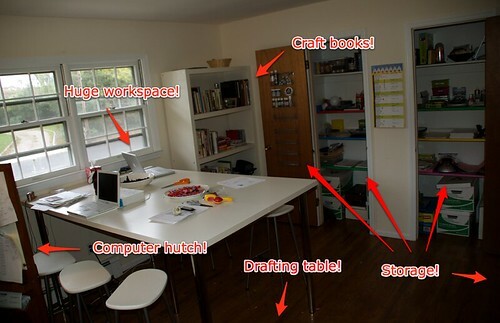 In our old apartment we had a buffet cabinet where we kept all the bits and pieces the kids needed for their creative endeavors, and it was perfect for our teeny space. Unfortunately, since moving into this house, we’ve had most of their things scattered about or, even worse, still boxed up in the basement. Several weeks ago we bit the bullet, realizing that as a family we really needed a creative space, and sacrificed our office/extra guest room. It’s been one of our best decisions ever. Really. Pretty much any time of day you’ll be bound to find one or more of us in the room — aided by the fact that Tomas and I both telecommute and use this space during work hours. I can’t tell you how pleased I am to have all my crafty books out, right where I can grab them for reference any time I want. The look on the kids’ faces is priceless when they ask for some random bit that they haven’t seen in eight months, and Mama knows exactly where to find it. Not to mention Tomas’ pleasure at having his drafting table free and clear of our stuff. We still have a bit of organizing to do, and definitely need to get some art up on our bare walls (my ugly-but-functional family calendar doesn’t count), but I am so very happy. All the new stuff is from Ikea. The table is two 78" long table-tops braced together. The legs are adjustable, which gives us the height we were looking for, but they are wobbly even though we braced the table to the wall, so we’ll need to replace them at some point. The stools were the cheapest ones available at Ikea at under $20 each. The Book shelf is the Lack which Tomas was especially keen to have because shelves are the same thickness as the frame which gives it a balanced look. I do have to admit it looks quite nice. The funnest part of the project (for me, since all I had to do was observe & make sounds of approval), are the shelves Tomas built in our two inefficiently used closets. This was Tomas’ first attempt at making his own shelving and I love that he recruited the kids to paint them cheery colors. Thanks! We do our wood-work in the garage & I’m with you on the “brrrr!” — I’m thinking any projects involving sanding or sawing will have to wait for warmer weather! So jealous! What an AWESOME space!! Oh how jealous I am–that is gorgeous. All that space! Nice! I’ve recently finished my office (which is intended to be a family project space), but have yet to unpack any boxes. Everyone has their own desk with attached bookshelf. The large project table in the middle of the room doubles as my desk. We also have room for an over sized arm chair that I plan on re-upholstering for a cozy reading spot. Now I just need to find time to unpack our supplies so that the space gets used! I am jealous of your beautiful windows. I regret not having planned a room on the main floor of the house for this space when we built. British Traditions London Bookcase Centre SectionThis British Traditions London Centre Section Bookcase is made from kiln dried wood in a humidity controlled facility. Classic bookcase standalone center section. Can be combined with London end sections to create an impressive, beautiful bookcase ….